We still go through growth spurts. But we’ve been through enough growth cycles that we know we’ll get through it and when we come out on the other side, it’s going to feel glorious. Becoming has been going some growth spurts too. We’re growing by leaps and bounds. But I tell you what, it can be a really painful ride at times. Coming up with the right topics, the right words, the right visuals. It’s quite the process. But because you are opening and clicking and reading, we know we’re on track and we’re starting to unfurl. We’re feeling pretty glorious right now. We’ve built this fantastic and enthusiastic coterie of women, and now we want to give them (you!) a voice in all this. Yes, to grow along with us (not to worry though, we’ll bear the brunt of the pain). 1. For our “Impactfully Good” good column, tell us what you do to give back. What causes are close to your heart and why. What ways do you contribute to the bottom line of life? 2. We’re also starting a travel section. For years we’ve busy with our careers or raising children…or both. As we steadily step off this fast track and on to our next chapter, the goal for many is to travel. Regardless of whether it’s abroad, or in your own backyard, we want to hear about your travels. We want your highlights and your itineraries, so we can share the tried-and-tested places to go, places to stay and things to do. 3. A new column that been waiting in the wings for some time is “Sister to Sister.” It’s about women like us. And when we say, “like us,” we mean non-celebrities or non-CEOs of major corporations. The women we’ll profile are navigating their next chapter in their own unique way. We want to hear about how you are navigating your next chapter, or we want you to nominate other women you know who are doing it and doing it well. 4. Another upcoming column is called, “Been there, done that.” It’s about beauty regimens that we, or our readers, have tried and what the results were. Do you have a regimen, procedure, or secret potion that you’ve tried? Whether it was a triumph or a complete fail, we want to hear about it. Pleeeaasse, pleeease, don’t be shy. Send your ideas to editor@becoming-media.com We’re going to be so thrilled to hear from you. P.P.S. And don’t forget to follow us on Instagram, where you can get more inspiration, motivation and behind the scenes action from Becoming. Make sure you like and comment so we know you’re there. Did you know that a report of child abuse is made every 10 seconds? Yes, every 10 SECONDS. And in the U.S., 4 to 5 children die from child abuse or neglect every day. Ugh. It makes my heart heavy that these numbers are so staggering. And that the most innocent and defenseless segment of our population lives in fear and desperation day-in and day-out. Sunny weather is just around the corner and we’re dying to get some new sandals. What are the trends you love for the warm season? Patrizia Casarini is a fashion designer who has worked with a children’s collection in NYC and Burberry in Spain, and now runs an interior design firm, Dalla Polvere. Why we love it? Once again, casual chic wins the day. 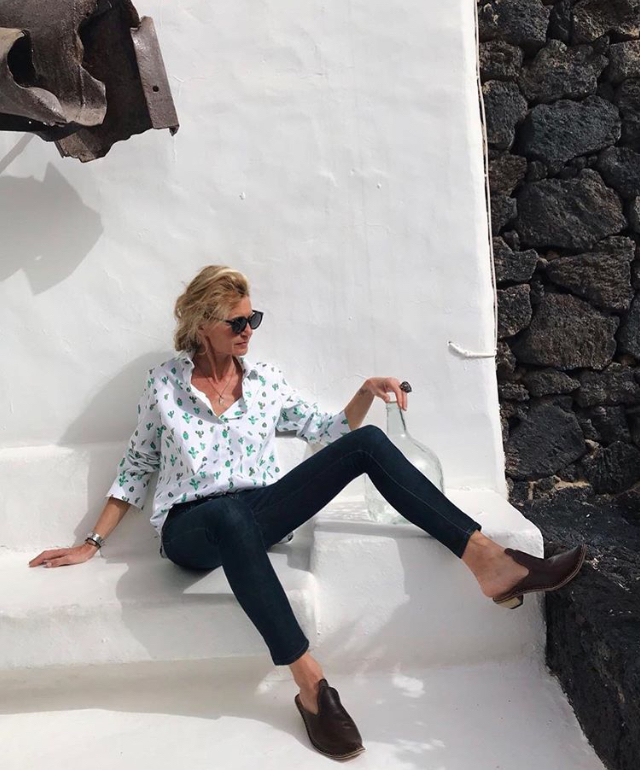 Sleek black pants or denim, a beautiful blouse, and mules create effortless style.